When veterans of the natural products movement get together, whether at an industry or clinical symposium, the conversation often turns to frustration with the industry’s failure to maintain high standards of scientific integrity. All too often, we are faced with product or ingredient claims that are unproven, exaggerated or in rare but painful cases, outright lies. As I will demonstrate below, the magnesium stearate controversy falls into the category of “unproven and exaggerated,” and the sheer durability of this non-issue is what is so surprising. I do not know a single organic chemist who feels that magnesium stearate is dangerous, let alone toxic. Nor do I know a manufacturer (other than a few whose marketing strategy is to demonize this common ingredient) who believes it poses a problem with the production of tablets or capsules. The issue remains for two important reasons. The internet is timeless. I’m sure you have noticed how urban legends are recycled on the internet. Some hoax is soundly debunked and it disapears – but only for a time; because the original issue remains in that eternal storehouse of information known as cyberspace. So a few years down the road, someone “discovers” the issue, does not bother to check its validity, forwards it to his or her entire mailing list, and voila, the hoax is reborn. There are people with a vested interest in perpetuating the legend. 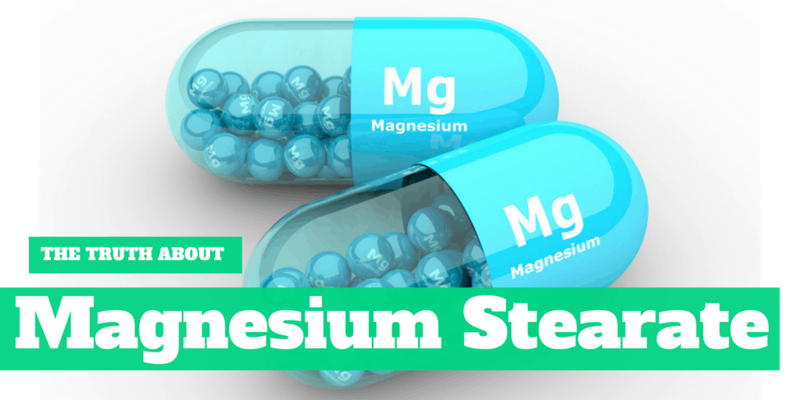 In the case of magnesium stearate, I believe it is a few companies who use this issue to differentiate their products from the vast majority of companies that use magnesium stearate as an aid in creating capsules and tablets. Forty years ago, the production of tablets and capsules was rudimentary. Gradually, manufacturers experimented with a variety of substances to help tablets hold together, and then disintegrate properly when swallowed. These ingredients known as excipients, went through rigorous testing to create the ideal product. In some cases, compounds called disintegrants were added to reduce the time it took for a pill to fall apart and release its nutrients in the gastrointestinal tract. In other cases, excipients were developed to delay disntegration in order to make a timed-release tablet. Manufacturers used different excipients for different purposes. You would not want to wait an hour for a sleep aid to disintegrate. But it is better for a multivitamin to dissolve slowly in a timed-release fashion. Stearic acid is a fatty acid found in a variety of nuts and seeds including coconut, cottonseed and chocolate. When it is stabilized with magnesium, the compound is known as magnesium stearate. Magnesium stearate acts as a lubricant in both tablets and capsules. In tableting, the lubricant properties facilitate removal of the tablet from the tablet press. In capsules, mag stearate acts as a flow agent to facilitate capsule loading. Because it is a fatty acid, mag stearate also prevents something known as interparticle bonding, and depending on the tablet ingredient, it can enhance dissolution and absorption parameters. [i] Because of these benefits, magnesium stearate is used in more than 80% of all tableted and encapsulated products. In the 1990’s, as competition in the nutritional supplement industry intensified, companies needed a way to differentiate their products from the rest. Thus the invention of “spray vitamins” and the claim that nutrients sprayed in your mouth would be better absorbed. This turned out to be false; spray vitamins actually had lower bioavailability – but that was only the beginning. Manufacturers started making claims for colloidal minerals, isotonic vitamins, liquid vitamins, chewables… all in an effort to appear new, different and better. Around this time, one company apparently decided that their claim to fame would be that they avoided using magnesium stearate. They first claimed that it interfered with tablet disintegration and dispersion. Even while this claim was being debunked by reliable and repeated testing,[ii],[iii] new statements circulated through the industry that magnesium stearate somehow surrounded tableted nutrients, reducing their bioavailability. Brochures and websites depicted this in colorful drawings. Drawings; as in an artist’s concept of what might occur in the gastrointestinal tract. At no time was this ever demonstrated, even though such technology (aspiration and 20X microscopy) is readily available. From 1985 to 2000, studies were published showing that magnesium stearate enhances bioavailability, [iv],[v],[vi] but the “controversy” endured. In 1999 a study was published showing that stearic acid can reduce risk for breast cancer,[vii] and still, the “controversy” endured. This is madness. Dissolution and dispersion is easily and consistently tested by cGMP procedures that have been the industry standard for over a decade. This is a non-issue that has produced confusion and error for far too long. Where else would we allow 40 year-old in-vitro data and a few sketches to influence our decisions regarding what brand of nutritional supplement to use in clinical practice? Yet this argument, supported only by speculation derived from test-tube studies, many from the early 1970’s and none within the last 20 years, continues to be raised by some cinicians across North America. I am calling on industry leaders to put an end to this charade. Those who perpetuate this “controversy” should either produce reliable evidence using today’s dissolution standards and procedures, or announce that the issue is not – and has never been – a valid concern for the industry, the clinician or the consumer. An ounce of chocolate provides hundreds of times more stearic acid than found in a daily dose any vitamin capsule or tablet. Yet the same people who decry the use of magnesium stearate also promote the health benefits of cocoa products. [ii] Changing the mag stearate level from 0.5% to four times that amount (2.0% of tablet) had no effect on bioavailability. Note: A compression of 500 kgf is on the low side to create what is known as a soft-press tablet. Tablet compression can go all the way to 2500 kgf. Univera products are produced using an average compression of 700 kgf and disintegration tests demonstrate optimum disintegration and dissolution. [vi] el-Mahdi IM, Deasy PB. Tableting of coated ketoprofen pellets. J Microencapsul 2000 Mar-Apr;17(2):133-44. The study of the relationship between dietary intake of fatty acids and the risk of breast cancer has not yielded definite conclusions with respect to causality, possibly because of methodological issues inherent to nutritional epidemiology. Individual fatty acids were measured as a percentage of total fatty acids, using capillary gas chromatography. Conditional logistic-regression models showed no significant association between n-3 PUFA and breast-cancer risk. In contrast, women in the highest quartile of stearic acid had a relative risk of 0.49 (95% confidence interval, 0.22-1.08) compared with women in the lowest quartile (trend p = 0.047), suggesting a protective role of stearic acid in breast-cancer risk.